Radio frequency identification (RFID) technology is increasingly found in food tracing as technology improves. Implementing RFID is not uncommon in the case of large containers containing raw products and in the mixing of bulk materials. It offers companies a number of ways to streamline and manage their capacities, focusing particularly on the issues of traceability and process reliability. Using wireless technology for identification purposes opens up a new dimension in automatic data recording. The automotive industry has been using RFID for years – where a tag is attached to the car body and is encoded with data options for each vehicle. As RFID tags are read/write devices and no visual contact of the tag is required, they offer more functionality than bar code technology. Moreover, they are very robust so that they can even survive harsh ambient conditions such as high temperatures, mud or wetness. This technology supplied by SICK Automation has allowed Kagome, a Japanese tomato processor, to ensure product traceability which increased efficiency in the production processes at its Australian factory. Traceability has always been important for the food and beverage industry. In recent years in Australia, however, the need for real-time recalls has increased due to plant processing errors or recalls from Food Standards Australia New Zealand (FSANZ). An effective tracking and tracing programme consists of a number of components, starting with accurate and fast identification. For many years the identification workhorse has been the ubiquitous bar code. As foodstuffs move through the production process, they are identified by a unique code; on containers when in process, on packaging for the finished product, on cartons and pallets during transport and on shelves in retail stores. Kagome, however, was looking for a real-time identification solution that could handle mud and tomato juice as well as heat, wind, and rain. 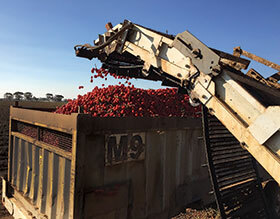 The Kagome factory operates 12 harvesters loading tomatoes into more than 300 14-ton capacity bins which, once full, are unloaded at a bin pad where a truck picks it up and transports it to a nearby weighbridge. One trip from the tomato fields to the factory takes approximately 90 minutes and each truck can load three bins – that is an average of 42 tons of tomatoes per truck. Three years ago trucks would queue at the weighbridge, waiting for up to 12 minutes before the truck load could be weighed. This was partially because of Kagome’s quality control process where three samples from each bin had to be processed in the laboratory for quality control purposes and to validate the tomatoes origins. Additionally, paperwork to document the harvesting process and quantity and quality of the yield was required, for which the truck drivers were responsible. A paper-based quality control system of this kind increases the potential for human error, which can sometimes result in contaminated products reaching consumers. To ensure traceability, the company decided it needed a paperless automated identification solution to be implemented at the weighbridge. Kagome installed six RFU63x units from SICK at the factory’s weighbridge and discharge hill. Each unit is equipped with three antennas for double stacked bins. Resistant and stable RFID tags were attached to the tomato bins, accompanying them from the start of the harvesting process. As a result, the RFU63x meets all Kagome’s requirements set out for paperless automated identification of tomatoes. In this way, RFID helps to prevent the typical errors made during inbound and outbound goods processes, such as incorrect quantity and quality data, or missing accounting entries, for example. RFID allows real-time identification of where the tomatoes originate. Due to paperless identification, truck drivers no longer need to leave the truck at the weighbridge, contributing to enhanced driver safety. This efficiency gain means that the truck is spending less time at the weighbridge and that truck jams in front of the weighbridge and the tomato drop hill have largely been eliminated. Truck time at the weighbridge was reduced from 12 minutes to two minutes, enabling truck drivers to do one additional trip per 12-hour shift. This means a productivity gain of 504 tons in total, which has been achieved thanks to using the new RFID technology from SICK Automation.